Product details: Unlike other products for white skin patches or vitiligo, this is not a fancy cream or lotion. Our product for white skin patches is an ancient Ayurveda method of natural treatment, remedy and cure. It is a 100% natural herbal blend of rare, expensive medicinal plants and essential oils specifically meant for the treatment and removal of white skin patches and retaining loss of pigmentation. There are absolutely no chemicals or preservatives. The product is in the form of a powder and has to be mixed with aloe vera gel or cucumber gel to prepare a paste before application. Product comes with gel. Click to see how the herbal blend and paste look like. Results and Effects: White skin patches (also known as vitiligo or leukoderma condition) is caused due to the loss of skin's natural pigmentation. The herbs in this product are exteremly effective is retaining skin's natural pigmentation. Helps treat white skin patches and other pale areas on the skin. Moisturizes, softens and smoothens the skin. Ingredients: Herbal blend contains the following herbs and essential oils. Click on any ingredient to see its medicinal use and value. Basil, Bawachi (Psoralea Corylifolia), Nagarmotha (Cyperus Rotundus), Chaulmoogra Oil Plus, Aloe vera or cucumber Gel is added to prepare the herbal paste before it is used. Click for complete list of ingredients used in our products. Preparation and usage: Prepare enough paste as and when needed by mixing equal parts of powder, gel and water. Adjust water for consistency. Wash the area with warm water. Apply a thin and massage until the paste dries out. Apply another thin layer and leave the paste on for 30-45 minutes and rinse with warm water. DO NOT wash with soap for at least an hour. Excessive paste may be refrigerated preferably in an air-tight container. May be used daily or at least 3 times a week. Treatment duration: On an average most customers use this product for 6-10 weeks depending on how severe the problem is. You could expect to start seeing results in the first 2-3 weeks. Side effects and precautions: In general our products do not have any side effects and are 100% safe. However, although extremely rare, certain herbs may make the skin sensitive to ultraviolet rays so please avoid sunbath's, solarium or any other direct source of UV light while the product is on skin or immediately after rinsing the paste. The first two times, please use the paste in a small area (about one square inch). If you haven't seen any irritation or burning then the product is completely safe to use on your skin type. Disclaimer: Roots Herbal Industries is against cruelty towards animals and therefore we DO NOT test any of our products on animals. 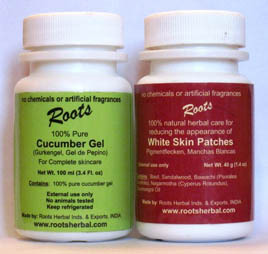 Although it is extremely rare, any side effect or reaction is purely based on the individual skin type and metabolism, and Roots Herbal Industries is neither liable nor responsible. You can order from our Yahoo Store, ebay or Amazon.